Facebook is an integral part of connecting with your customers and nurturing your relationships. 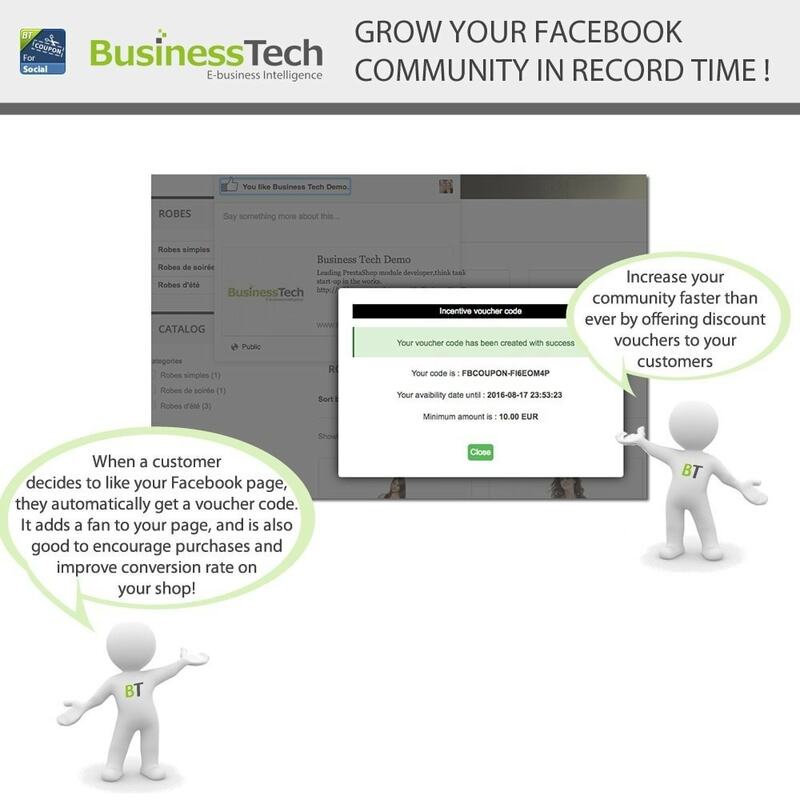 Your Facebook community will grow faster than ever. Facebook popularity will help your store go viral and grow your customer base. A block will be displayed on your PrestaShop website, which will allow visitors to get a small discount code when they decide to Like your Facebook page. 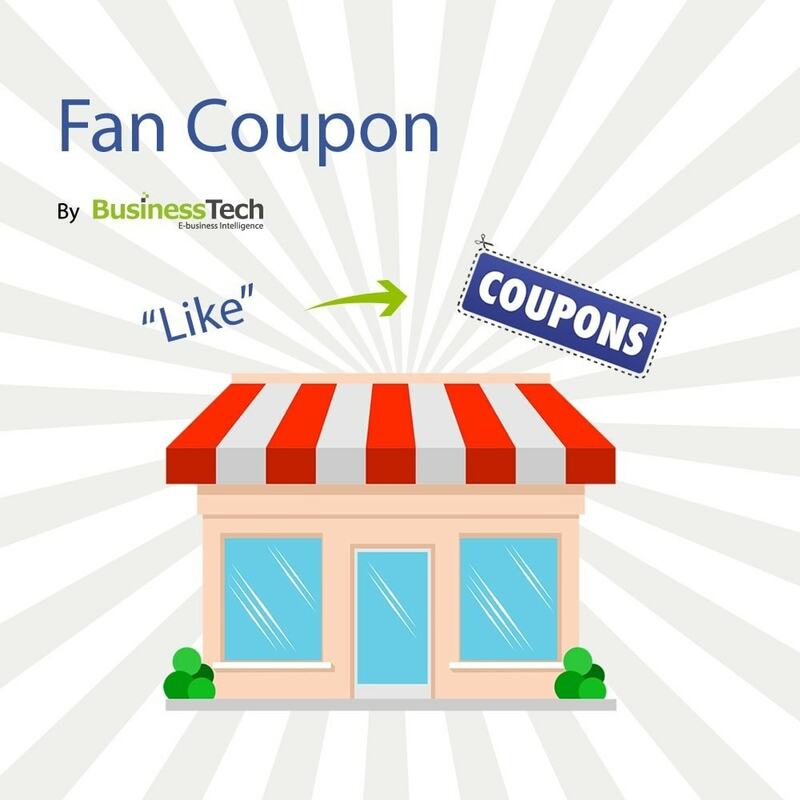 These will be high-quality new fans for you, especially if you position the Fan Coupon block only in the cart summary / checkout page, as they will be visitors who have already added products to their car and obviously have a real interest for your products. This will therefore allow you to quickly gain new fans on your Facebook page, but fans that have a true interest for your shop and will therefore be much more likely to act upon any product or promotional posts on your Facebook page. Nobody turns down a discount, especially in exchange for a single click ! Your customers will easily be agree to like your page ! Moreover, doing this, they will better be informed of your offers and news because its will directly be accessible from their social network they consult very frequently. 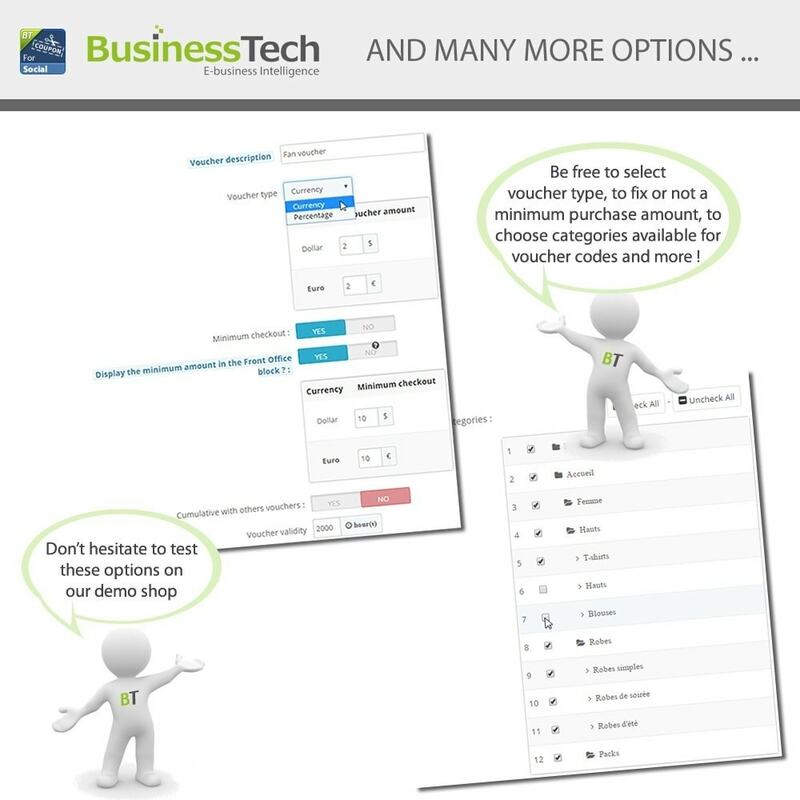 By installing this module you offer your users the opportunity to receive a voucher in exchange for a click on the "Like" Facebook button. Regarding this, Facebook is likely to access certain information relating to their browsing. We remind you that, as responsible for the use of personal data of your customers and visitors and in order to respect the new European General Data Protection Regulation, you must clearly inform your users of this, in an easily accessible documentation(e.g. your Terms and Conditions). You must provide them with the link that will direct them to Facebook’s personal data policy(https://www.facebook.com/about/privacy/update). You also must inform them of their rights, in particular their right of opposition to the use of their personal data and the means to assert their rights.